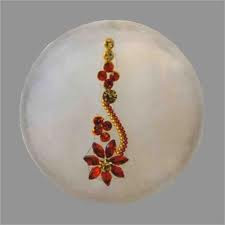 A bindi (from Sanskrit bindu, meaning "a drop, small particle, dot") is a forehead decoration worn in South Asia (particularly India, Bangladesh, Nepal, Sri Lanka and Mauritius) and Southeast Asia. Traditionally it is a dot of red color applied in the center of the forehead close to the eyebrows, but it can also consist of a sign or piece of jewelry worn at this location. Traditionally, the area between the eyebrows (where the bindi is placed) is said to be the sixth chakra, ajna, the seat of "concealed wisdom". According to followers of Hinduism, this chakra is the exit point for kundalini energy. The bindi is said to retain energy and strengthen concentration. It is also said to protect against demons or bad luck. The bindi also represents the third eye. The red bindi has multiple meanings which are all valid at the same time. This is also a spiritual symbol. In meditation, this very spot between the eyebrows (Bhrumadhya) is where one focuses his/her sight, so that it helps concentration. Most images of Buddha or Hindu divinities in meditative pose with their eyes nearly closed show the gaze focused between eyebrows (other spot being the tip of the nose - naasikagra). Swami Muktanand writes 'auspicious Kumkum or sandal wood paste is applied (between the eyebrows) out of respect for inner Guru. It is the Guru's seat. There is a chakra (center of spiritual energy within human body) here called Ajna (Aadnyaa) chakra meaning 'Command center'. Here you receive the Guru's command to go higher in Sadhana (spiritual practice) to the 'Sahasraar' (seventh and final chakra) which leads to Self realization. The flame seen at the eyebrow is called 'Guru Jyoti'. The encyclopedic dictionary of Yoga informs that this 'Ajna Chakra' is also called as the 'Third eye'. This center is connected with the sacred syllable 'Om' and presiding it is 'ParaaShiva'. After activation of this center, the aspirant overcomes 'Ahamkar' (ego or sense of individuality), the last hurdle on the path of spirituality. (Encyclopedic dictionary of Yoga, by Georg Fuerstein, Paragon House Publ, NY, 1990,p.15).